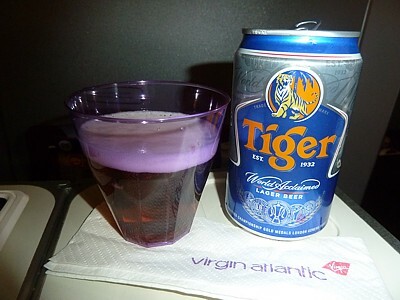 Wine, beer and spirits are technically free on Virgin Atlantic in economy, but you only get one serving, and on a 12 hour flight that can hurt. 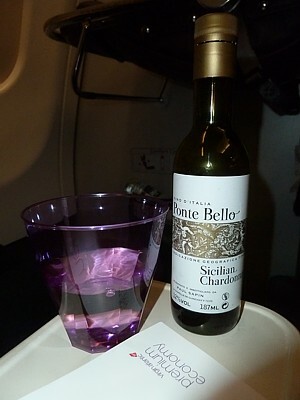 All wine in economy is served to you in a small plastic glass, from a large bottle on the trolley, however in Premium Economy you'll get a proper glass glass and a miniture 187ml bottle of wine. In Premium Economy you get a slightly better wine selection: but there is only one type of red, and one of white on offer. It is selected for Virgin Altantic by Berry Bros. & Rudd, the London wine merchants. Sometimes you suspect they aren't really trying too hard. Premium Economy White This is an opulent, gently fennel-scented Chardonnay, with a hint of Mediterranean herbs. It's perfectly drinkable, but not very remarkable. Indeed, with 3,000 years of wine culture and a perfect vine-growing climate, the sun-drenched vineyards of Sicily produce more wine than Australia, and today’s wines are just as fruity and accessible. a generous, sunny and toothsome style of wine, with the notes of spice and leather of Francophile Syrah. 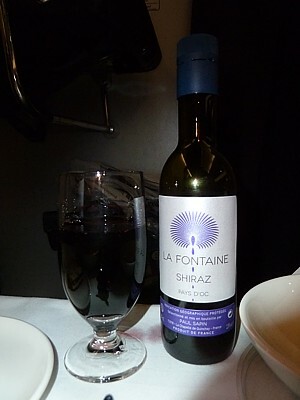 The local Australian use of the word Shiraz for France’s Syrah has come to typify this style, and now the description is permitted for European wines. Although created in southwest France, this wine has all the amicable elements of Down Under. It's a trifle tart, and by no means memorable, but it does do the job. White wine on virgin is served out of a normal full sized bottle infront of you - and you only get one serving, so you've got to get the right choice first time. The white is a fairly normal Australian Nottage Hill Chardonnay. A blended wine, at least its consistent and not true Oz winelake. It has a complex fruity character, full bodied, with a pleasant but long lasting aftertaste. 13%. Goodness knows what this stuff is. A curious mixture of the bottom of the barrel it'll leave your stomach in knots and your head thumping. Foul, and to avoided at all costs, the only benefit to Virgin carrying this noxious concotion seems to be so the adverts can say Virgin offer a choice of wines. White and Red. But this red is so bad, it can only be used for flavouring food... and that if you're unlucky. 10.5%. The famous Dutch export Heineken is made of purified water, malted barley, hops, and yeast. Tiger Beer ha a distinctive, clean, crisp taste. It's one of the few beers you can put away at altitude without getting a hangover. Tiger Beer is an award winning lager that has won accolades the world over, including more than 30 international brewing gold medals since 1939. Tiger has been brewed in the Far East since 1932, using only hops, malted barley and a special strain of cultured yeast, to deliver its flavour. In Premium Economy you'll always get a welcome drink of Sparkling Wine, then on some flights you get offered a pre-dinner drink. 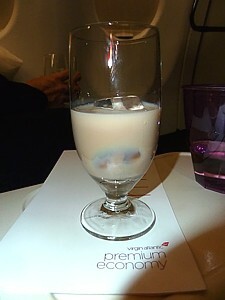 On all flights you'll also get offered Baileys after dinner. 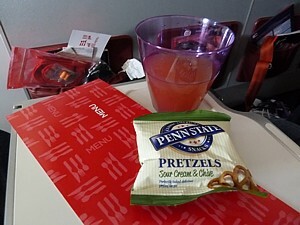 On all flights in Premium on Virgin you'll be offered a pre-flight drink of Sparkling Wine or Orange Juice. 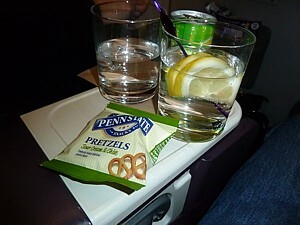 Great after a long dinner over the Urals on your way to Kong Kong, before getting some kip at 38,000 feet. 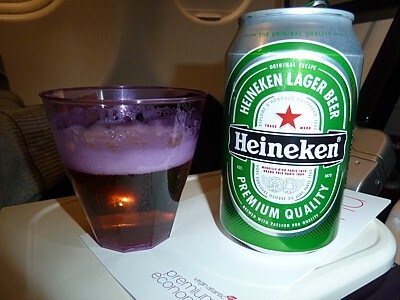 In Economy you will be offered a pre-dinner cocktail: if it's on offer, it'll be in the menu.